Plextor has announced some of the goods they will be demonstrating at CES this year. The company is to offer 3D (vertically stacked) NAND SSDs to offer more performance and volume at lower cost. Also it will introduce the M8Se PCI Express SSD and a compact external SSD. Nothing much is shared on the 3D NAND SSD specs wise, except a mention that that they have a higher durability, reliability and performance at lower cost. The same applies to the M8Se series, except that they get a better heatsink, so performance does not collapse due to thermal throttling. External SSD get more details. The EX1 (we'll have a review soon) has a size of 2.5 x 7.6 cm and weighs only 30 grams. He would be shock resistant and also works with Android. There is a USB Type-C port for quick and universal data transfer. The drive would have write speeds of 500 to 550 MBps. FREMONT, Calif., Dec. 20, 2016 (GLOBE NEWSWIRE) -- PLEXTOR, a leading developer of award-winning solid state drives (SSDs) and other high-performance digital storage devices for consumers, today announced it will introduce its first 3D NAND SSD during a “sneak peek” media event at CES 2017. PLEXTOR will also showcase its super sleek, lightweight, and ultra-slim external SSD - the EX1. With an ultra-compact size (1”x3”), almost weightless at only 30 grams, it is smaller and lighter than a deck of playing cards, making it ideal for road warriors requiring access to important files without internet connection. The EX1 is shock-proof, ultra-portable, and supports on-the-go (OTG) storage for Android devices. * With transmission speeds up to 500/550 Mbps, it is a definite alternative to slow USB drives. Equipped with a Type-C connector and Plextor's powerful, high-performance SSD, the EX1 is a definite contender in external storage solutions. To add some peace of mind, the EX1 comes with optional data encryption software. Bah that's not too old, I remember 5.25 floppies (That's not the storage size.) 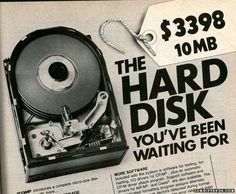 and when mechanical HDD's at a few GB was a huge thing. Nice to see the SSD market growing so quickly, need to switch over to that eventually but probably won't happen until I build the next completely new system. EDIT: Of course before that there was also HDD units of a couple of MB being a huge thing and before that but the HDD sizes were a "little" bit bigger still. But I had terrible luck with both readers and burners, as well as mediums themselves. Teacs and Pioneers would just die on me. Btw there is a difference between this 3d nand and vnand?